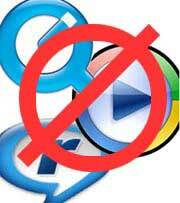 In the beginning there was RealPlayer, Quicktime and Windows Media Player; and formats such as .avi, .wmv, .mov and .rm. Then, Flash started being able to display video formats and became the default method for doing so. So, what’s the future of online video? Actually, the future is already here in the form of HTML5, the new language standard for web browsers. While those standards are not yet writ in stone — and, truly, of course nothing on the Internet ever is — most modern browsers already have the ability to interpret new HTML5 specifications. Although much about this isn’t being written on film websites, developer and design websites frequently write excitedly about using new HTML5 tags such as <article>, <section>, <header>, <audio> and, most importantly for filmmakers: <video>. Previous HTML standards needed an arcane method of properly formatting videos to play in different, specified players, such as the ones I mentioned in this article’s opening statements. However, with the current ubiquity of online video, HTML5 and web browsers are working to make it easier for anybody to upload and display videos without having to go through third-party websites such as YouTube and Vimeo. Since HTML5 is still in serious development and all the different web browsers haven’t standardized themselves on how to display HTML5-ready videos, there are still a few unfortunate quirks in the system. However, the process is still unbelievably easy, as I’ll demonstrate by example. This is as basic as it comes. Web browsers such as Firefox, Chrome, Safari and Opera — if you have updated editions — will play it. Internet Explorer, versions 8 and below, won’t. Internet Explorer 9 might, but I haven’t played around with that one yet. Each browser comes with its own default player, while Firefox is perhaps the most advanced with a right-click full-screen option. There are also other default options that can get called up with special code notations. And, if one is handy writing jQuery, one can fully customize the playback controls and have them appear in a standardized format across all browsers. For those without a modern browser, I’ve made this video backwards-compatible to a Flash player so that it could play in non-HTML5 accepting browsers. There are some serious drawbacks right now to embedding video like this. One is that there still is no singular video format standard. I’ve had to create two different format versions to make sure the video plays in as may browsers as possible. And I’ve also uploaded some other formats so it’ll play as Flash. Those two format version extensions are pretty obscure right now: .webm and .ogv, which I don’t think many video editing software programs offer. So, how did I get ’em? Easy! I used the free, open-source Miro Video Converter program. That thing works like a snap with the most basic drag-and-drop system imaginable. While it takes some special configuring right now to get a video from an iPod to embedded in a WordPress-based blog such as the Underground Film Journal, these are the standards in which the web is heading. The process is about to get insanely easy in the immediate future. By that I mean go from taking five minutes to less than one. Of course, with online video there are still other hurdles, such as dealing with bandwidth issues. My 26-second video shouldn’t cause too many server problems — actually, I’m kinda crossing my fingers on this — but if the Underground Film Journal had high traffic and I was serving up a feature-length film, things could come crashing down pretty badly. But, again, this is the future, so start dreaming. You could start putting up your own feature-length films behind a paywall on your own website and not have to deal with any third-parties either taking a commission or you having to host your film on their servers. The HTML5 video revolution is here and, frankly, the film world isn’t really talking about it. Guess what? We should be. Absolutely. It’s pivotal stuff. Even in schools, Webm and Ogv are not being mentioned as much as they should. I delivered a PD to twelve teachers who were delivering a Unit in video assets and none of them were familiar with those containers. I demonstrated Miro and JS Video Player but they seemed to dismiss it. Still stuck on Adobe export notions it seems.